Gadget, you raise an interesting point. 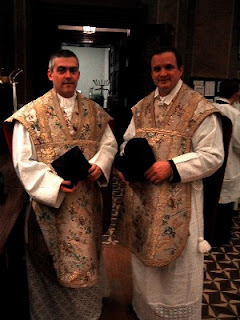 One of the arguments for robes (and therefore vestments) is that, like school uniform, they are a great 'equalizer' when it comes to the personalities of the wearers. What Bad Vestments shows, brilliantly, is that today they are very often used by the wearer not just to make a fashion statement, but a theological point. Instead of 'Don't look at me', I rather fear they have become, 'Look at me, this is what I believe, and doesn't it make me look great.' Which is a worry. This is an off-repeated (mis)apprehension (albeit made from the best motivations), but I think you'll find that the world's biggest Christian denomination uses vestments and, moreover, the average make-up of a Catholic mass is far, far more diverse than the average middle-class pleasantries and electric guitar Jesus-is-almost-as-great-as-John Lewis evangementali st service! Why would those outside the Church want to go to a 'Christian' rock show, when they can go to the real thing, or stay in and listen to their iPod? Conversely, an urge for the Sacred is not satisfied in such amusements yet is by the Church. Don't you yourself think sanctification (including that which most naturally denotes or at least suggests it) is more important that mere entertainment? Afterall, if you scrapped Holy Communion and started giving out free booze at evening services then I think the number of attendees - certainly amonst the Yoof - would rise! Trust me, the 'world' is not going to look at Wesley Owen, Mark Driscoll et al and have 'well, I thought that Mass was a bit strange, but this is normal!!' epiphany. Which doesn't negate said entities of course. Hmm, is dressing to make a theological point necessarily bad? Afterall, you could argue that leading services and preaching is by its nature a kind of performance, so it's perhaps better to embrace its implication than pretend they don't exist? Interesting. "but for many outside the church, they just make us appear even more obscure or irrelevant"
No, homophobes, the American right, creationists, witch hunters and mad street preachers do a better job of that. School uniform was bad enough. And I saw my gym kit in a vintage shop today. Bah! ....but how many other jobs invite a discussion of the clothing involved? Vestments feel elitist to me, and I for one would probably not attend a church that had the whole rig oot oot every Sunday. Just as long as you are not in the vintage shop along with it then you're doing okay! I wonder if those few who openly predicted the credit crunch seemed obscure or irrelevant. What you believe is surely more important than what you wear, or what your leaders wear for that matter. Let them wear what they want to wear. As for me, I prefer ordinary clothes. Andrew, that is an unjustified extrapolation. The christadelphians et al have predicted the end of the earth a few times and we are still here. They would appear obscure and irrelevant in that respect. I'm more or less with you on the vestments, Billy. It's just that I was concerned that you should lump creationists in with those other groups. We are the ones who voice our unease about the philosophy of evolution, which may turn out to be a house of cards. I guess very few people who study the Bible would deep down believe that the world was going to end on a date named by any human agency. However, I would also guess that some involved in the world of finance would deep down have known that their dealings were unsustainable. It has been called "the power of conventional thinking". Likewise many people (not just Christians) may have doubts deep within about the philosphy of evolution. And talking of extrapolation, you have to be willing to extrapolate to a huge extent to believe in the timescales necessary to support evolution. Andrew - Creationism and intelligent design are not science. They are a religious ideology. In contrast, evolution is a scientific theory which - like all theories - is falsifiable. This hasn't happened. For good reason. Instead, the creationist lobby spend their billions spreading lies and cant'. I understand that it would be *easier* for certain Christians if evolution wasn't true (why figure out a series view of what God's Word says when we have the easy option of Young Earth inanities) - but you seem an honest guy : by what right is scientific fact to be discounted on the basis of particular human opinion on particular scripture verses? I hope you know that creationism is very much a recent 1930s revivalism type invention - and in no way should be taken as something mandates by orthodoxy. Quite the opposite. Andrew, I most definately lump creationists in with the other groups. Furthermore, creationist sites often drip with homophobia. Creationism relies on lies and deliberate misrepresentation. I went to a talk once by Ken Ham and I was enraged by the lies (and homophobia) that I heard. What doubts do you have about the philosophy of evolution? Have you actually read any sites that are pro-evolution? Read this AND thie first link http://www.talkorigins.org/faqs/macroevolution.html All the creationist sites are full of lies, and strawman arguments. What is wrong with the evidence for an old earth? You could try reading this for starters http://springerlink.com/content/uh78u254754ntm17/fulltext.html it also contains references. All dating methods also agree. If you have a truely open mind, I'm happy to correct any lies you have read. Agreed, better left in the mists of time!!!!!! !